A Spanish villa-style home built for Motley Crue drummer Tommy Lee and actress Pamela Anderson and later owned by Boys Don’t Cry frontman Nick Richards is back on the market in Malibu for $3.475 million. The home’s latest appearance on the Multiple Listing Service is far from its first. The estate has been shopped on and off since Richards sold the property in 2015 for $2.2 million. The 1991-built home was described in listing details as in need of renovations when Richards sold it, but has since been restored anew with 7,462 square feet of bright living spaces and modern comforts. 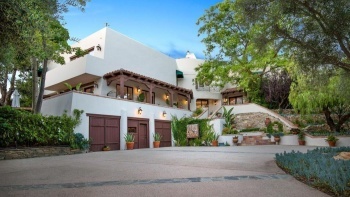 Beyond the front door is a two-story rotunda entry with Spanish tile floors under a wood-beamed ceiling. A dual-sided fireplace anchors the space, while an ornate wrought-iron staircase rises adjacent. Living spaces include a step-down billiards room with a wet bar, a wine cellar and a family room. The master suite is complete with a dual-sided fireplace and spa-like bathroom for a total of six bedrooms and six bathrooms. Outside, the 2.3-acre property centers on a lagoon-style swimming pool and spa with waterfalls. Lush landscaping surrounds multiple stone patios, a koi pond and a grill to complete the grounds. Sigi Ulbrich and Pam Moran of Berkshire Hathaway HomeServices California Properties and Melissa Echeverria of Keller Williams Realty share the listing. While she has yet to publicly confirm whether she is in a romantic relationship with Adil Rami, reports recently surfaced that she’s moved to France to be with him. And Pamela Anderson, 50, appeared devoted to the 32-year-old footballer on Sunday, when she was spotted cheering him on as his team Olympique de Marseille faced off against AS Monaco during a home game at the Orange Vélodrome. Looking chic in a plunging floral dress, the former Baywatch star was on hand to catch all of the action on her trusty camera – including when the central defender got things off to a high-octane start with a goal in the game’s seventh minute. The mother-of-two looked decidedly glamorous for the sporting event, thanks to her white-and-red gown of choice, which hugged her famous curves and ample bosom. With her golden tresses resting about her shoulders in gentle waves, the Canadian-born star highlighted her natural beauty with a makeup palette of warm colours that included deep pink lipstick and blush. As she watched the match from her VIP box at the Ligue 1 team’s home stadium, Pamela chatted away with fellow supporters – all while keeping her eye on the action. Her outing to the game – which saw the teams walk away with a 2-2 draw – comes days after TMZ reported that she has taken her relationship with Adil to the next life by moving into his home in Marseille. According to the website, Pamela is in regular contact with her two sons, Dylan, 20, and Brandon, 21, in America and they frequently fly out to see her. It is also claimed that she has no plans on returning to live in the US. MailOnline has contacted representatives for Pamela Anderson for comment. A source previously told Us Weekly that her sons have already met her alleged lover – who also plays for the French national team – and they approve. The pair are said to have met at the Cannes Film Festival last year and have reportedly been ‘inseparable’ ever since. Pamela’s pairing comes after it was heavily speculated she was dating WikiLeaks founder Julian Assange. Pamela was first linked to Julian in September 2014, when she was spotted at London’s Ecuadorian embassy, where he has been living in political exile since 2012. Meanwhile, Pamela has now leased her plush Malibu estate, complete with swimming pool, sauna and private beach, for an eye-watering $70,000 per month. The Malibu Colony beach house, California, – which she purchased for $1.8m in 2008, has been remodelled over time, and is now available to rent for $70k in the summer months [£50,200 approx] and $40k for a 12-month lease [£28,700 approx]. She has yet to publicly confirm her romance with Adil Rami. But it seems as though Pamela Anderson, 50, is smitten with the football player, 32, as she has now taken their relationship to the next level by moving in with him in his native Marseille, France, according to TMZ. The Baywatch star is said to be trading in the sunnier climes of Los Angeles for European living and has also brought along her Golden Retriever, Zuzu, for the new chapter in her life. According to the online platform, beautiful Pamela is in regular contact with her two sons, Dylan, 20, and Brandon, 21, in America and they frequently fly out to see her. It is also claimed that she has no plans on returning to live in the States. MailOnline has contacted representatives for Pamela for further comment. A source previously told Us Weekly that her sons have already met her young lover – who plays for Spanish team Sevilla FC atop the French national team – and they approve.